The subject of menus is not something that historians tend to focus on. Indeed, whilst the splendour of a medieval banquet is depicted in many history books, the actual menus themselves make for great research and reading. 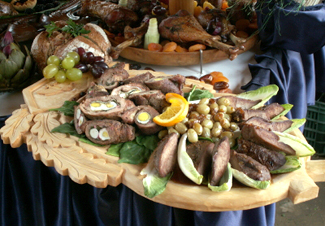 They had to be specially prepared of course and usually only for a grand occasion such as a feast in a medieval castle. It is generally believed that an enormous amount of care and time was devoted to the preparation of banquet menus. This was because the food was usually served for the rich and important people of the time, often keen to impress their guests with a wonderful ‘showpiece’ of food and wine. Banquets held for kings and members of royal families were particularly extravagant and lavish. Most medieval banquets had 3 or 4 courses with an interlude of entertainment or music in between each course. The greatest of banquets such as would be fit for a king or member of a royal family would often have up to 7 courses. The most lavish banquets were on a scale that it is hard to relate to. There is an incredible description written by Legrand d’Aussy, an acknowledged historian of French cookery. He describes a magnificent feast given in 1455 by the Count of Anjou, third son of King Louis II of Sicily. If only someone had committed that menu to paper and it was still around today. Now that would be a menu to beat all menus!